If you’re looking for a fast, delicious, and healthy meal, this brown sugar glazed salmon is it. 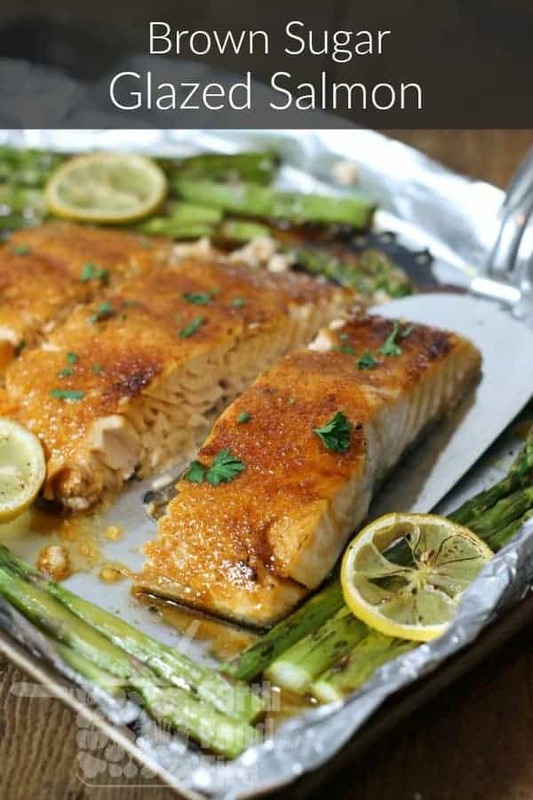 Crusted with a thin, lightly spiced brown sugar glaze, making baked salmon has never been easier. 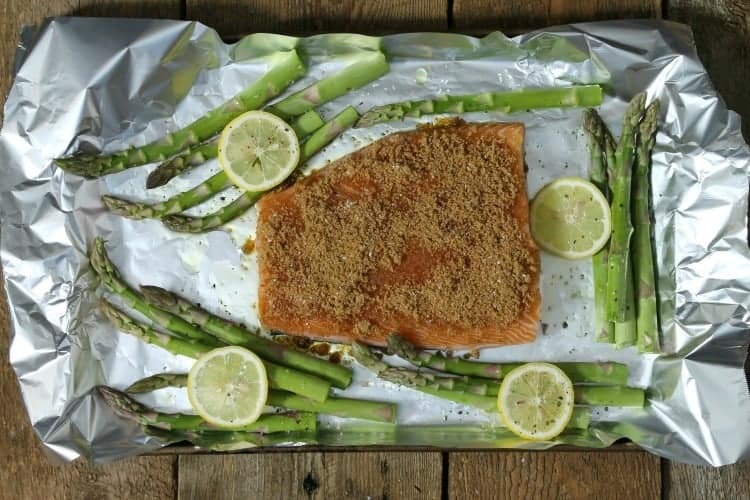 Simply top the salmon with the spice/sugar rub, surround the fish with some fresh vegetables, and bake it in the oven for a quick meal ready in half an hour. Serve the baked salmon with the roasted asparagus, and some basmati rice for a filling and impressive meal you can be proud off. What Temperature Do You Bake Salmon At? For this brown sugar glazed salmon, we’ll be using a pre-heated 400F oven. 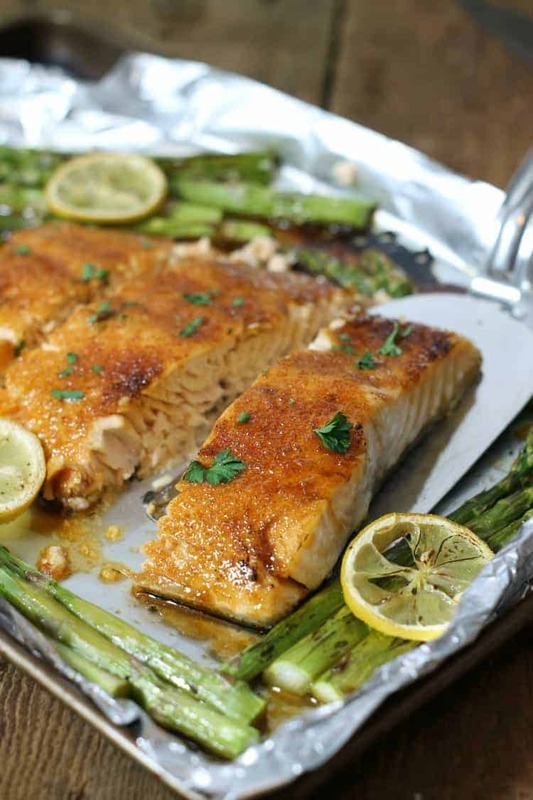 The high heat ensures the salmon is cooked quickly, while allowing the brown sugar crust to melt and caramelize in the oven. The 20 minute cooking time this recipe calls for ensures the salmon is cooked to an internal temperature of 145F without drying out. You can use a digital or mechanical food thermometer to check the temperature of the salmon once cooked, though if the salmon flakes apart when pressed with a fork, it will be done. 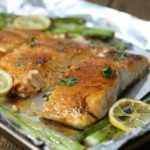 Is This Baked Salmon Recipe Healthy? It is! Even though the fish is crusted with brown sugar, the amount actually consumed in this recipe is minimal once the fish is cooked, portioned into four pieces, and served along side other foods. 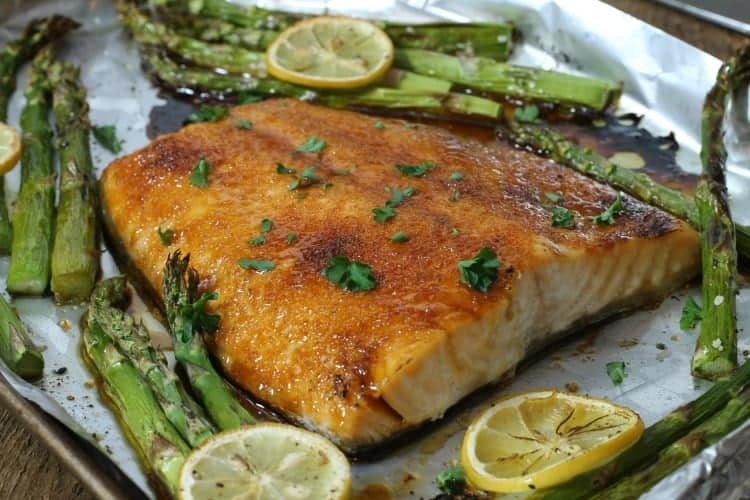 Since some of the brown sugar melts of the side of the fish and isn’t eaten, each portion will probably contain no more them half a tablespoon (or 6 grams) of added sugar. This amount falls well below the daily recommended intake of 37.5 grams for men and 25 grams for women. Outside of the brown sugar, the salmon itself is rich in omega-3 fatty acids, B vitamins, potassium, selenium, and is a great source of protein. When served alongside the roasted asparagus, and some basmati or wild rice, you have a complete meal cooked from scratch, which is much healthier then any takeout or processed food you can pop in the microwave. Enough chit-chat. Let’s get to it shall we! 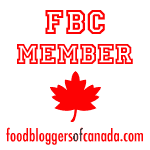 You’re here to learn how to bake salmon in the oven after all. Before you start though, it’s a good idea to get everything ready so you can easily put everything on the sheet pan at once without having to wash your hands multiple times after touching the fish. I would suggest preparing the spice mix and vegetables first, as well as starting a pot of rice on the stove if you are so inclined before handling the fish itself. In regards to the vegetable used I would recommend using a green vegetable such as green beans, asparagus (as I have done here), or broccoli and red bell pepper. The key is that whatever vegetable you choose should cook in 20 minutes at 400F. A root vegetable for example will most likely still be under cooked after this time. 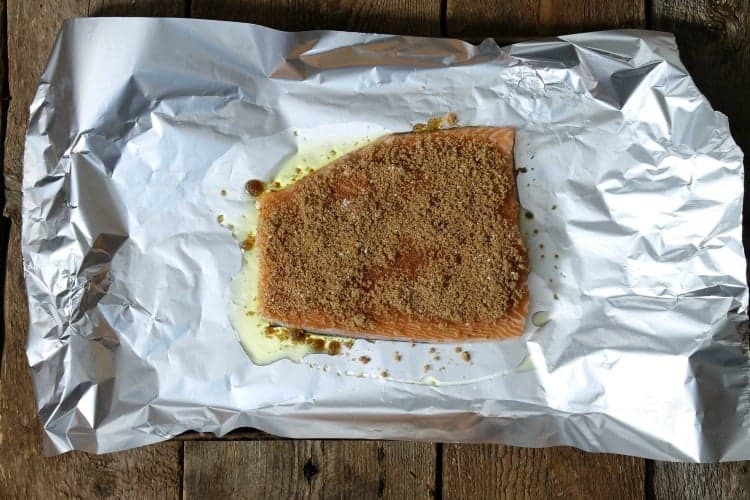 Pre-heat your oven to 400F and line a sheet pan with parchment paper or tinfoil. Mix all the spices together in a bowl and break up and clumps with your fingers. Set the mixture aside and trim/ prepare any vegetables you wish to roast along side the salmon. Drizzle 1 tbsp of the olive oil on the lined sheet pan, and place the salmon fillet on top of this skin side down. Slide the fish around to coat the pan with oil and prevent the fish from sticking. Evenly spread the spice mixture over top of the salmon, keeping as much of it on the fish as possible to prevent the sugar from simply burning on the pan. Toss the prepared vegetables with the remaining olive oil, and spread the vegetables out evenly around the salmon fillet. Top the vegetables with the sliced lemon to keep it moist, and infuse a little flavor into it as it cooks. Bake the salmon and vegetables at 400F for 15 minutes. Then switch the oven to broil, and continue cooking for another 5 minutes to crisp up the sugar glaze. Remove the brown sugar glazed salmon from the oven, check the internal temperature, portion the fish and serve immediately. Make sure to keep an eye on the oven the last 5 minutes as you broil the fish. If the sugar glaze starts to get to dark, remove the salmon from the oven to prevent it from burning. Dark brown is fine, black is not! So simple and delicious, this brown sugar glazed salmon is one of the easiest baked salmon recipes you'll ever try. A quick one pan meal for any night. Bake the salmon and vegetables at 400F for 15 minutes. Then switch the oven to broil, and continue cooking for another 5 minutes to crisp up the sugar glaze. Remove the brown sugar glazed salmon from the oven, check the internal temperature, portion the fish and serve immediately.